Sometimes saving money is just a simple click away. Consider the recent review we completed on the Superannuation payable function within a client's payroll system. The owner of business knew something wasn't quite right as the Superannuation payable for his staff always seemed to be too high. We were engaged to review the employees' contracts, conditions of work, including the various allowances and overtime arrangements and how the client's payroll system calculated the Superannuation payable on each of these payments. We found someone forgot to a button and the result was Superannuation was being overpaid. Most business owners would know that Superannuation is not payable on overtime and on paid Parental Leave Payments, but does the payroll system knows that as well? 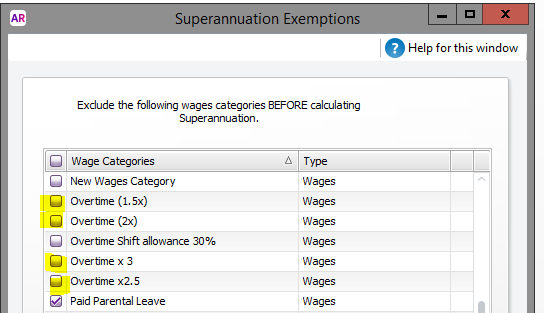 In this case the overtime categories had not been excluded from the calculation of Superannuation resulting in potentially thousands of dollars being overpaid. As the screen shot below shows, paid parental leave was excluded from the calculation but FOUR different overtime categories were forgotten. It was the missing that costs. It pays to be alert to these oversights, and sometimes new staff mistakenly unclick the categories in the belief that the previous person got it wrong. The rules around employee entitlements are complex especially around casuals, overtime and all of the various allowances found in Awards and Agreements. What do you do if you discover you have overpaid your employees' Superannuation? There are certain time limits in place to fix the problem, otherwise the money is gone for good. If you need any assistance in this area please contact our office. The screen shot is from MYOB but all the major payroll software programs have the same issues.